“I will do my best to bring the victory for the Vietnam Olympic football team in the semi-final match with the Republic of Korea (RoK) at the ongoing Asian Games 2018 (ASIAD) in Indonesia”, head coach of the team Park Hang-seo has said. Speaking at a press conference after the team’s 1-0 win over Syria in the quarter-final on August 27, Park thanked the team for their efforts that lead to the historic victory, affirming that he will try all the ways to help his team reach the final. “We have only two days to prepare for the coming semi-final and it will be difficult, but the RoK is in the same condition,” he said. In reply to questions on his selection of personnel for the upcoming match with the RoK, Park said he has principles in choosing the starting lineup for a match and any player who has a good attitude and quality can be selected. 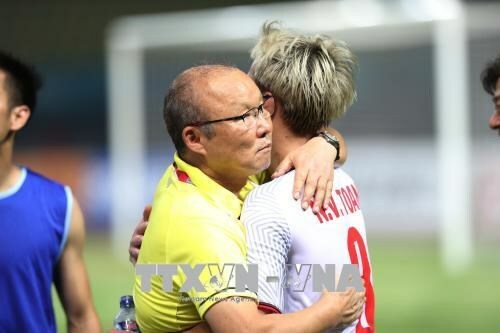 “I am proud of my players and that is why I am happy to be leading the team”, said the coach who is a Korean himself. “I always tell my players that they need to be confident and make their utmost to bring victory for their country”. The only goal in Vietnam’s win on August 27 was scored in the 108th minute by Nguyen Van Toan, who replaced striker Nguyen Cong Phuong in the 82nd minute. Vietnam will meet the RoK in the semi-final at 4pm on August 29. This is the first time Vietnam has reached the semi-finals of an ASIAD.